Whip Strip for Baseball | Immediately Increase Your Bat Speed 15%! Learn how to improve overlap grip enhancer for softball baseball swing power distance performance hitting & batting! What things can a hitter do to increase bat speed, power and performance? Watch any of the most powerful & successful hitters in MLB….Albert Pujols, Josh Hamilton & Ken Griffey Jr, and what do you see? Whip Strip enables “ANY” hitter the ability to gain maximum bottom hand grip for Top Hand Release upon contact with the batted ball. This allows the hitter to achieve the highest possible post batted ball speed which ultimately results in harder hit & longer balls. When Mark McGwire shattered Roger Mans’ single-season homerun record, The Sporting News ran a story on the changes that McGwire had made in his swing. It pointed out that the turning point in McGwire’s rise from inconsistent slugger to home-run legend occurred when he adopted Top Hand Release. Some baseball people put it this way: McGwire became a great power hitter when he began to release his top hand after impact. A top-hand release is the result of a maximum lead-arm extension and a high finish. Whip Strip increases the batters bottom hand grip by 30% thereby allowing the batter to lower their bottom hand further down the bat handle while dropping their bottom hand pinkie onto the knob of the bat. This technique increases leverage and length of the bat and results in quicker hands, increased bat speed and maximum performance! When the bat length is increased by dropping the hand and bottom hand pinkie on the knob of the bat, the bat head moves faster through the hitting zone resulting in greater bat speed! In essence, by doing this you are lengthening the bat. A longer bat = more leverage = more bat speed. Whip Strip also allows the batter to maintain loose hands and limit the “death grip” on the bat. Think about it for a moment – When a batter grips the bat too tight with both hands, he is also tightening all the muscles in his wrist & forearms. This limits the performance of the batter as the tension is increased by the tight grip. Tension is a killer for bat speed and hitting performance. Whip Strip enables the batter to achieve the highest possible bat speed by maximizing bottom hand grip and lessening top hand grip. Loose hands are fast hands! Whip Strip relieves all tension in the wrists & forearms. Having loose hands allows the batter to react quicker and increase bat speed! Try a Whip Strip…You’ll Immediately Feel the Difference! Whip Strip can be used as BOTH a Practice Training device and is LEGAL EVERYWHERE for in-game use. A common injury witnessed in baseball players is a Hamate Bone Fracture. The most common symptom of the Hamate bone fracture is pain, which can make it hard for a baseball player to grip a bat. The pain might be made worse when swinging the bat, to the point where the player cannot continue through the swinging/gripping motion. There is also inflammation or swelling around the Hamate bone, which might be seen on the wrist or palm area. Sometimes the swelling can be seen within minutes if the bone was hit hard enough. If the pain continues for a few days, a computerized tomography scan is taken, which can show the image of the broken Hamate bone. Often times, the Hamate bone fracture is not uncovered until an imaging scan is taken, since it cannot usually be seen on the outside. Surgery or removal of the Hamate bone is usually required. This usually results in the player being on the DL for up to 3 months. Whip Strip can assist a baseball player greatly in the recovery time and getting back on the field swinging and gripping a bat again as is greatly reduces the need for the player to grip the bat using their own bottom hand strength. By increasing the bottom hand bat grip Whip Strip allows the player to swing the bat without relying on the hand to grip the bat tightly. Whip Strip does all the gripping for the player. 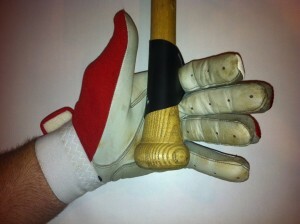 As you can see, Whip Strip is attached to the index finger and then is wrapped around the bat handle. Whip Strip allows the batter to swing smoothly and not have to rely so much on hand strength gripping the bat handle. The point of pain in Hamate injuries is the bottom right side of palm where the wrist meets the hand. Whip Strip places all the pressure at the hinge point of the index finger vs Hamate area while swinging. This greatly helps players get back into the game after Hamate surgery or allows one to continue play through a Hamte injury for the remainder of a season/playoffs until surgery can be performed.